What is it about fashion that’s keeping us restless all the time? 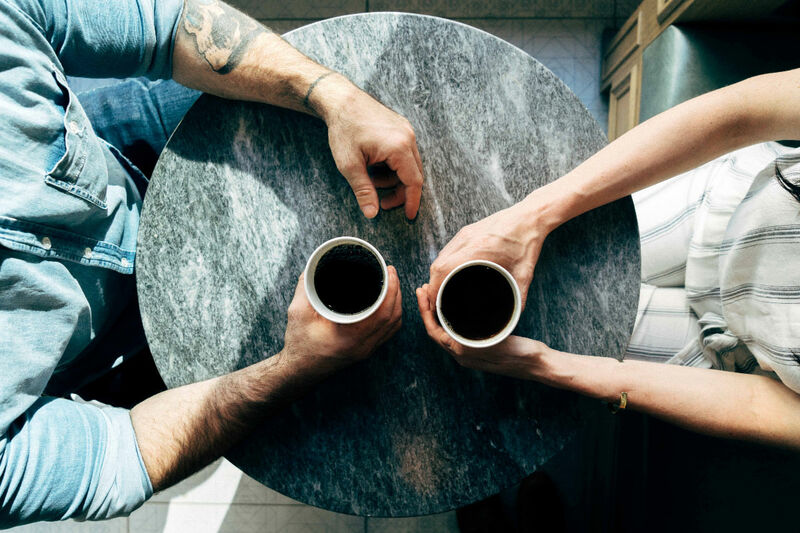 It seems like we can’t get enough of trends, that we’re spinning in circles constantly for the sole purpose of finding that one outfit that will blow everyone’s mind (and ours, too). However, with so many options out there and so many fashionable choices, it’s definitely too difficult to stick to a single pattern/idea/style and stay true to it; I mean, why not experiment when we have the chance! Summertime doesn’t really tolerate constrained fashion; it’s all about mimicking the easy vibe of summer through light materials, edgy accessories and summer appropriate fashion choices. The new two trends that are catching everyone’s eye are the new bohemian and English rose; both are styles allowing for plenty of individuality combined with the already familiar bohemian and feminine choices, however – upgraded. Embrace the complicated prints, flowy gypsy dresses and skirts, slip on dresses with thin strips and unusual cutouts; the effortless chic is what will make you the queen of summer, as long as you embrace your individuality well and blend it with appreciation for world cultures, pattern-wise. Don’t be afraid to combine outré graphics with delicate lace and lots of chunky statement jewelry! 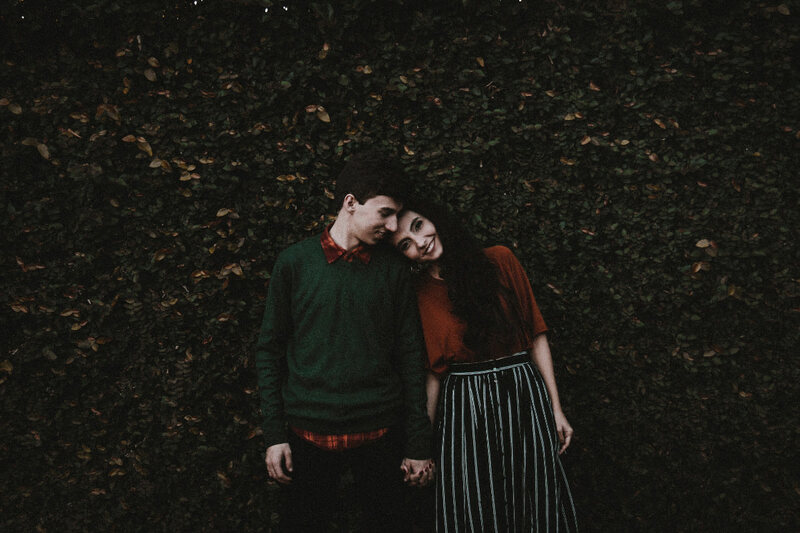 What we are learning this summer is that romance is not dead and nostalgia for sweetness still lives; this time around, you are encouraged to cherish both femininity and feminism, since your fashion choices revolving around lush volumes of fabric and floral prints mustn’t jeopardize your strength and sturdiness. Still, don’t be afraid to look pretty for pretty’s sake! Embrace lace, florals, maxi dresses, peplum and love the joys of pink blooms! Turbans, hair accessories (flowers, butterflies, almost-tiaras…), chunky jewelry, statement earrings – everything evoking femininity; lay off with leather and fringe this time around – they worked for Coachella, but won’t for the upcoming summer. Designers took a risk and finally made it possible for girls of all sizes and shapes to wear fashionable swimwear that celebrates a female body; bikinis, sure – but everything is now focused on the femininity of style and shape so buy a swimsuit that channels ‘60s vibe, unexpected cuts, high-waist bottoms and easy colors. 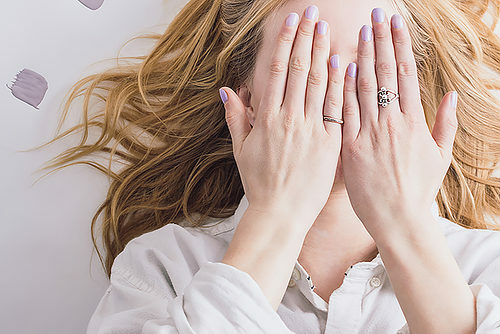 Once the sun hits your skin and you get that dark, bronze glow there’s honestly so little makeup you need – nobody enjoys a face with melting makeup nor does your skin appreciate being suffocated by powders and concealers when the temperatures are high. If you really need to get dressed up for an occasion, opt for melt-proof makeup and toss the goopy glosses. Also, embrace waterproof mascara and prevent the raccoon look. Instead of a regular powdery blush, use a gel blush on your cheeks and dab it with a sponge; you’ll get a wonderful summery glow which will contour your face but stay translucent; lips will appreciate a little coral pop of color and will perfectly match the neutrality of face. Oh and – don’t forget the sunscreen! Let the hair breathe; when the sun is strong and you are spending a lot of time in the water, treating your hair with various products is insane. First, you’ll damage it (the sea salt doesn’t really correlate to artificial product), second – what’s the point! No hairdos, either – let your hair loose and allow it to curl up naturally. A high ponytail or samurai bun is welcome, though. Pack it all up, pack light and choose the pieces you know you’ll wear – be a fabulous fashionista even during summer, not the one everyone is rolling their eyes at ‘cos she is bringing three suitcases to a 5-day summer bash. Enjoy! None other the most acclaimed ace designer of India ‘Sabyasachi Mukherjee’ designed the wedding costumes for both Virat and Anushka. The fashion designer itself revealed the exclusive choice and taste of celebrity couple who decided to tie a knot in a private Italy ceremony. The beautiful couple wanted to keep paparazzi away from their nuptial ties thus decided to keep it a secret and low-key affair. The wedding and pre-wedding functions took place in the luxurious Tuscan villa in the small village of Tuscany. Everything looked like a day coming straight from the fairytale. The choice of colours, decoration, outfits and rest of the things were no less than a spell casted. 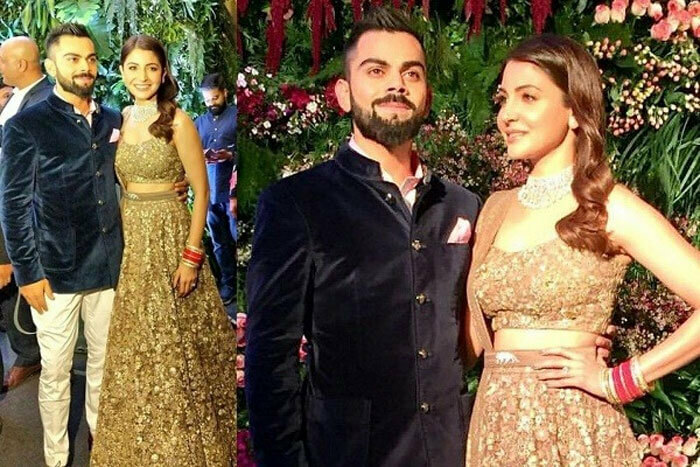 Let’s take a look at Anushka’s flawless garments for her beautiful wedding with Virat. Here are the functions which took place and how the bride embraced each of these special moments with her natural beauty and incredible ensemble. 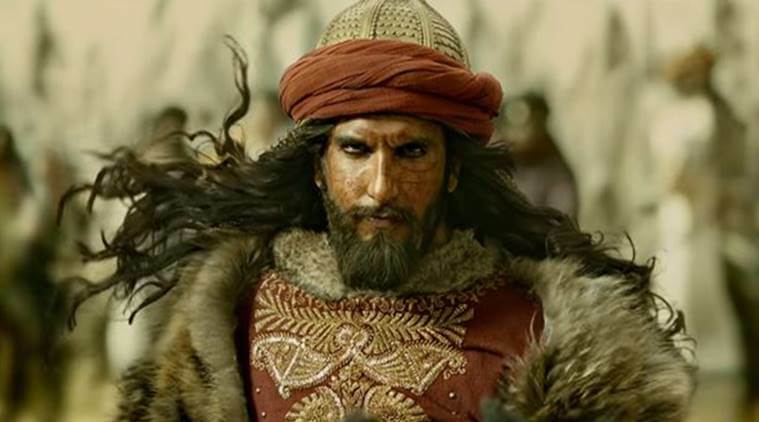 The day both the stars left the country, there were speculations going on about their big day arrangement and it happened to be true later when they decided to tell the big news via social platform. The first function which took place was the engagement ceremony. 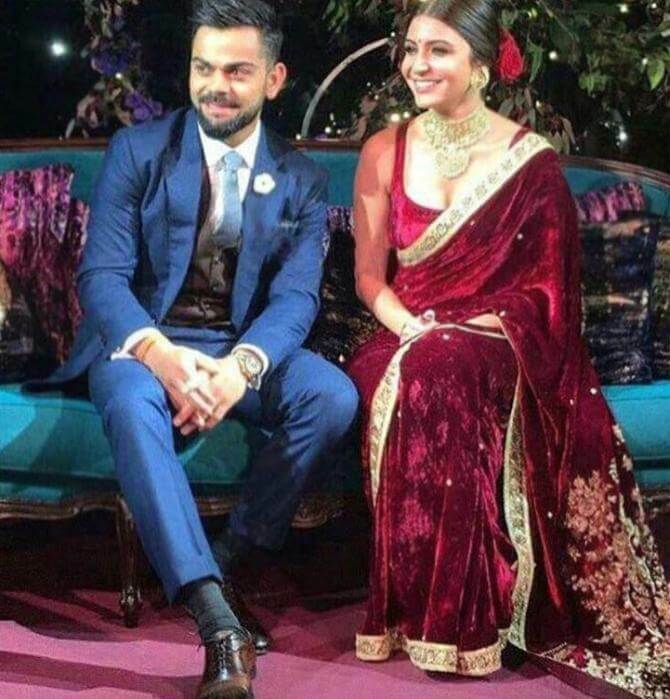 For which, Anushka decided to get into special Sabyasachi velvet saree in signature gulkand burgundy hue. The saree looked exceptionally royal and graceful. It was handcrafted using miniature pearls and embedded with finest quality zardosi and marori. Big round of applause for incredible designer fashion Sabyasachi who created this stunning weave! The beautiful bride-to-be paired her attire with uncut diamond and pearl choker along with matching studs. Her look was completed with sleek bun, red roses, kohl eyes and iconic micro dot bindi. Isn’t she looking gorgeous??? Since we all know about Anushka and her vibrant personality, her aura was clearly evident in her mehendi look. She got herself painted in the vibrancy and richness of bright colours and looked exquisite. She donned pop printed top and paired with matching fuchsia pink and Indian orange skirt. 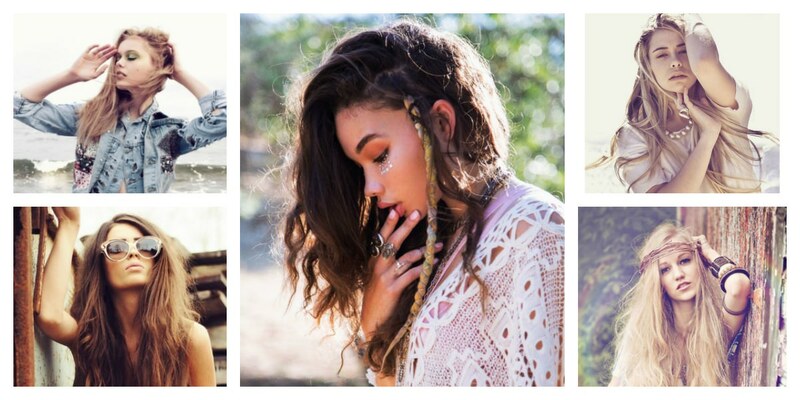 Her look was unique, cool and classic boho style. She went for stunning pair of jhumkis to complete her look and her neat hairdo was cherry on the top. 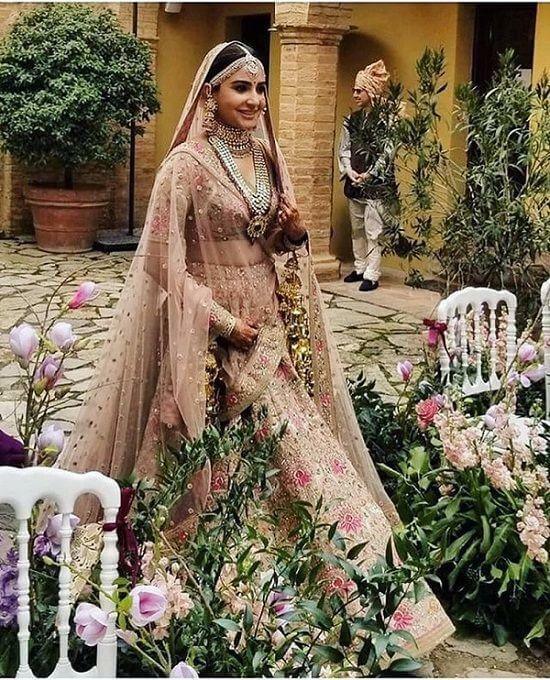 The best part was that Anushka kept her look comfortable and classic which is truly a fashion tip for upcoming bride-to-be. If your D-day is on the way, take fashion notes to get your dream bridal look and make heads turn around. Yes, here comes the main day which nobody was clear of but as soon as the picture came down on internet, the whole country couldn’t believe their eyes. For her wedding day, Anushka surprised us once again with her subtle and elegant choice of jewellery and outfit. She wore pale pink lehenga embroidered with vintage English colours and embellishment of silver-gold metal thread, beads and pearls. The best part was the light makeup which complemented her attire in the best possible way. She truly looked like an angel landed from a beautiful fairytale. Her wedding lehengas bridal jewellery was all from Sabyasachi’s heritage collection. And here comes the day everyone was waiting for eagerly because it happened to be in the capital of the country and around the country’s people. 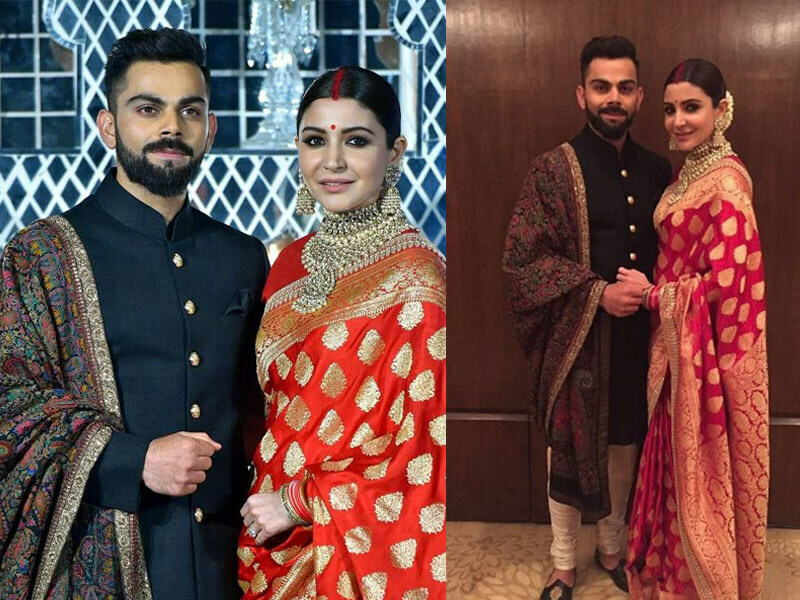 For her first reception in Delhi, Anushka couldn’t resist but went for typical red Banarasi saree will golden zari work. There is definitely some undying, unsaid connection of Indian brides with red colour. They just can’t let it go. Anushka wore classic red Banarasi saree paired with red bindi, vermilion, and mogras in her hair. The look was exceptionally exquisite and captivating. For her jewellery, she again went for heritage uncut diamond choker and jhumkas from the Sabyasachi bridal jewellery collection. In clear words, she looked like a newly married Indian bride on her Delhi reception. Now what everyone is awaiting for big fat Mumbai reception which would see a swarm of big Bollywood celebrities and cricket personalities. Let’s see what Anushka has planned for this ceremony. Well, our fingers are crossed and we are hoping to see her again in some different style and avatar. After all, Sabysachi Mukherjee can never go wrong. The grand affair saw a swarm of big Bollywood celebrities and cricket personalities. The best thing to observe here was Anushka’s dressing which was completely different from her previous attires. The beautiful actress picked grey hued lehenga embellished with sequins and exclusive Bengal tiger belt. She paired up her designer outfit with diamond necklace and sleek hairstyle which totally worked with the vibes of the occasion. Along her side, Virat looked dapper as always in a light pink shirt and velvet Bandhgala. The couple posed for shutterbugs and spent great time with their friends and colleagues. The night was indeed special. So with this occasion, finally comes to an end to grand Virushka celebration. Well, I have to say that this December was all about their lavish, most desired wedding. Cheers to the power couple!